As you may know, bathroom is possibly the most dangerous area in your house when it comes to electrical safety because water is a sound electrical conductor. The consequence of an electric shock is far more severe in the bathroom because your wet skin reduces the body’s resistance and the effect is very dangerous. Here is a proven solution to help you stay safe! Everyday light switches are dangerous because of dampness and wet hands. An ideal option is the employment of a “touch-free” switch inside the bathroom to control electric lamps. Presented below is the circuit diagram of a touch-free switch which is, in fact, an electric toggle switch with infrared close proximity sensor built around a couple of inexpensive electronic components. The circuit is simple, straightforward, and self-explanatory to a certain extent. Key component of the design is an RPR-220 reflective photo sensor (photo reflector) from ROHM Semiconductor (www.rohm.com). Build the circuit on a piece of prototyping board and fit it complete with the power supply in a waterproof, transparent enclosure. Make sure that the photo sensor can ‘see’ the outside world without any obstruction. You can take one wire of the bathroom lamp and connect it to one of the relay contact (X1), and then extend the connection from second contact (X2) of the relay to plug into the power point. That is to say, just route one wire – the phase line – through the relay as incase of the common light switch. Construction and connection of this circuit should only be carried out by suitably-qualified personnel, and all applicable electrical safety regulations must be observed. In particular, it is essential to ensure that the relay chosen is appropriate for use at domestic AC grid voltages and is suitably rated to carry the required current. 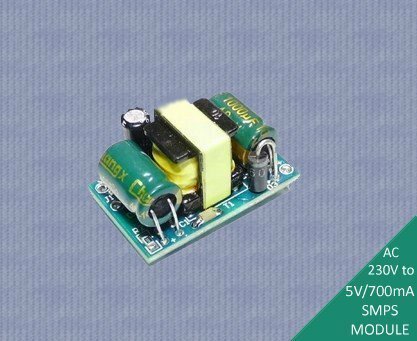 Power supply for the circuit is provided by a standard 5V SMPS. There’s an LED in the circuit to indicate the presence of power in standby state. Author’s prototype was tested with a small 5V/700mA SMPS module purchased from eBay. Okay, get ready to see what happens when you are waving your hand in front of the photosensor. The first wave will switch the lamp on, and the second will switch the lamp off. Well, it might take some effort at first but it’s simple enough that a kid could run it! Using the component values shown, the proximity detection range will be about 5 to 15 centimeters. The operating point of the receiver input circuit is rather dependent on strong light levels and the value of R2 may need to be adjusted a little to avoid false detection. Obviously, the RPR-220 photo sensor should be mounted such that the lit can only pick up the reflected infrared light.